Ten-man Inverness Caledonian Thistle fell four points adrift at the foot of the Scottish Premiership with defeat by St Johnstone. Steven Maclean bundled home the opener five minutes before half-time. The hosts, slacker after the break, had beleaguered striker Larnell Cole sent-off after he confronted the referee. Liam Craig sealed the win from the penalty spot with two minutes to play, before Graham Cummins finished a sumptuous stoppage-time move. And things got worse still for Caley Thistle after the match, with captain Gary Warren shown a red card in the tunnel. Saints remain five points clear of Hearts in fourth place, and closed the gap on third-placed Rangers, who play Aberdeen on Sunday, to three points. With game after game ticking past, Inverness' position looks increasingly perilous. Next weekend's trip to Motherwell, second-bottom on goal difference, is now seismic. This contest turned nightmarish for the hosts after a bright opening, but the truth is, given their predicament, Caley Thistle did not threaten St Johnstone's goal enough. Billy Mckay sent a shot over from close range. Alex Fisher nodded a diving header wide. Carl Tremarco miscued a volley. Greg Tansey did draw a save from Alan Mannus when he rasped in an effort from outside the box, but Richie Foran's side never looked likely to find the net. Their best opportunity came immediately after the Saints went ahead, when Tansey fed Cole, who seemed to panic in a terrific position and shot straight at Mannus. Cole's dismissal ended the contest when he appeared to be cautioned twice for challenging referee Stephen Finnie's decision not to award a foul. St Johnstone were merciless and could have had more. With just one win from their last 21 league games, Inverness look deep in trouble. Tommy Wright's side deserve so much credit. Saints were tactically brilliant, so strong defensively and ruthlessly capitalised on their man advantage. They took one of their few first-half chances when Michael Coulson broke down the left and sent a dangerous ball across the six-yard box. Owain Fon Williams could only parry into the danger area, Cummins' shot was blocked but Maclean followed up to force it home. They should have had another when Craig's superb curling corner flew all the way to the back post where Cummins slid in and somehow knocked it over from two yards. Craig, in his 300th appearance for the club, coolly converted a spot-kick after Cummins was tripped to seal the points. Cummins then slammed home after Miller danced around the area to tee him up, before Craig cracked the bar amid the late flurry. With a tendency to finish the season strongly, and just a three-point gap to Rangers, the Perth side look capable of something special this term. Inverness CT manager Richie Foran: "It is a tough time of the season to be sitting bottom, and I need real men to stand up to that, but not enough of them did that today. "It is pure luck we are still in it and it is only four points. I sound like a broken record but one win changes it - that is the truth. But I need braver players with more passion and desire. We controlled aspects of the game without having that ruthless edge to it. I don't think we believed today. "The main person who is not good enough is me. I am obviously not doing my job right and big apologies to the supporters. I believe we let them down today. "It is not good enough. I pick the team, I pick the shape, I will take 90% of the blame for that but the players need to stand up as well." St Johnstone manager Tommy Wright: "We went in 1-0 at half-time without playing particularly well but looked a threat. We looked comfortable enough and then after the sending-off, we were ruthless. We scored two and maybe could have scored two or three more. "The attitude to go and kick on and make sure we got that second goal, to make sure we weren't having any problems in the last few minutes, was excellent. "It's been a week that didn't start so well that's ended absolutely magnificently for us. We enjoy defending. We don't panic when we're under pressure. We're a good side that can do both sides of the game. "There's a better chance tonight (of finishing third) but we're not going to get carried away. We'll just keep working away. It keeps us five ahead of Hearts. It was an important result." Match ends, Inverness CT 0, St. Johnstone 3. Second Half ends, Inverness CT 0, St. Johnstone 3. Attempt missed. Graham Cummins (St. Johnstone) right footed shot from the right side of the box misses to the left. Liam Craig (St. Johnstone) hits the bar with a left footed shot from outside the box. Goal! Inverness CT 0, St. Johnstone 3. Graham Cummins (St. Johnstone) right footed shot from the centre of the box to the top left corner. Assisted by Chris Millar. Goal! Inverness CT 0, St. Johnstone 2. Liam Craig (St. Johnstone) converts the penalty with a left footed shot to the bottom left corner. Penalty conceded by Carl Tremarco (Inverness CT) after a foul in the penalty area. Penalty St. Johnstone. Graham Cummins draws a foul in the penalty area. Attempt blocked. Chris Millar (St. Johnstone) right footed shot from the centre of the box is blocked. Attempt missed. Graham Cummins (St. Johnstone) right footed shot from the right side of the box is close, but misses to the right following a fast break. Substitution, Inverness CT. Scott Boden replaces Jamie McCart. Substitution, St. Johnstone. Craig Thomson replaces Blair Alston. Second yellow card to Larnell Cole (Inverness CT). Larnell Cole (Inverness CT) is shown the yellow card. Hand ball by Liam Polworth (Inverness CT). Substitution, St. Johnstone. Chris Millar replaces Steven MacLean. Attempt saved. Carl Tremarco (Inverness CT) left footed shot from the centre of the box is saved in the top centre of the goal. Attempt missed. Billy King (Inverness CT) left footed shot from the centre of the box misses to the right. Attempt saved. 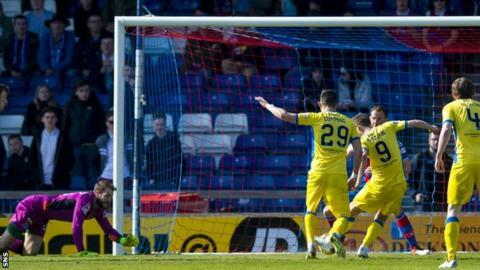 Larnell Cole (Inverness CT) right footed shot from the centre of the box is saved in the top centre of the goal. Tam Scobbie (St. Johnstone) wins a free kick in the defensive half. Graham Cummins (St. Johnstone) wins a free kick on the left wing. Substitution, St. Johnstone. David Wotherspoon replaces Michael Coulson. Attempt missed. Michael Coulson (St. Johnstone) right footed shot from outside the box is too high from a direct free kick. Attempt saved. Greg Tansey (Inverness CT) right footed shot from outside the box is saved in the bottom left corner. Blair Alston (St. Johnstone) is shown the yellow card for a bad foul. Larnell Cole (Inverness CT) wins a free kick in the defensive half. Foul by Michael Coulson (St. Johnstone). Attempt missed. Billy King (Inverness CT) left footed shot from outside the box misses to the left. Attempt blocked. Billy McKay (Inverness CT) right footed shot from the centre of the box is blocked. Foul by Louis Laing (Inverness CT). Michael Coulson (St. Johnstone) wins a free kick on the right wing.